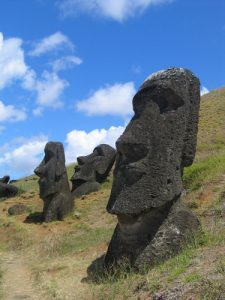 Ask most people to tell you something they know about Easter Island (Rapa Nui) and it’s likely that they’ll tell you about the mysterious moai – the sculptures that can be found around the island. Readers of this website will know that it’s also a pretty good hiking destination. But what else do you know about it? Have a go at our five questions below and see – you might surprise yourself! This entry was posted	on Friday 30 March 2018 at 14:14	and is filed under Chile, Trivia. You can follow any responses to this entry through the RSS 2.0 feed. You can leave a response, or trackback from your own site.